Every day you wear the Beads of The Goose, the next morning you will poop an egg. When this happens, there’s a five percent chance you will poop an egg made of solid gold and worth roughly 100GP. In the morning, roll a d20. A 20 means the egg is gold. If the egg isn’t gold, it’s still safe to eat. Also, the yolks match your skin color. 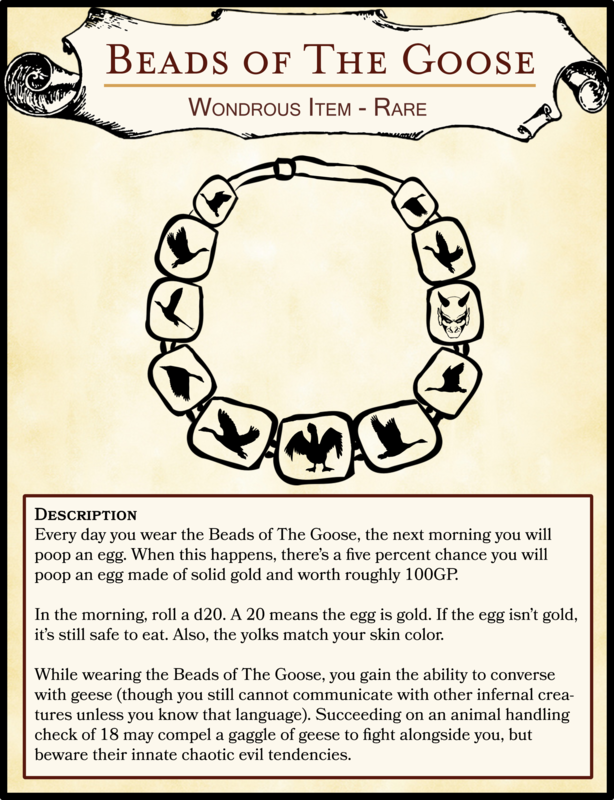 While wearing the Beads of The Goose, you gain the ability to converse with geese (though you still cannot communicate with other infernal creatures unless you know that language). Succeeding on an animal handling check of 18 may compel a gaggle of geese to fight alongside you, but beware their innate chaotic evil tendencies.